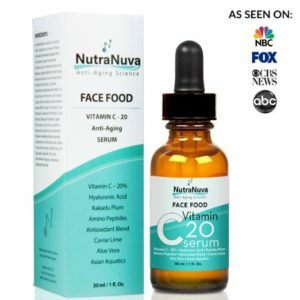 This vitamin C facial serum contains potent anti-aging ingredients from natural sources that are now being recommended by dermatologists and plastic surgeons. Scientific studies have shown that people using this vitamin C facial serum twice each day, resulted in 45% fewer wrinkles in 2 months of use. 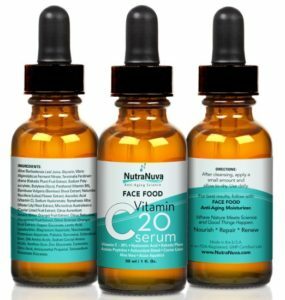 You will be pleased to know that the NutraNuva line of skincare products is specifically designed for people over 25 years of age and has been endorsed by Dr George Orloff, a renowned Hollywood Plastic Surgeon. Lots of clinically proven skin enhancing ingredients. Packed with antioxidants for brighter skin and to fight free radicals. Improves skin texture and smoothness. Boosts hydration and plumps up collagen. Nourishes, repairs and renews your skin. Free from fillers, parabens, dyes, sulfates and artificial fragrances. Made in the USA in an FDA-Registered State-of-the-Art Facility. 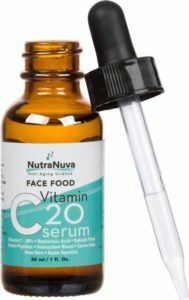 Who should use the NutraNuva Vitamin C Serum? If you want to keep your skin in tip top shape and reduce the signs of aging as much as possible, then this vitamin C serum is perfect for you. Even if your skin is looking tired, dull and dry with a lack of smoothness, then the vitamin C, hyaluronic acid and all of the other fabulous, and nourishing ingredients in this facial serum will greatly improve the look and feel of your skin. 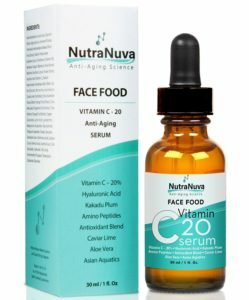 So anyone whose skin is showing some signing of aging or you just want to be proactive about your skin – this vitamin c facial serum will make a perfect addition to your skin care regime. Aloe Barbadensis Leaf Juice, Glycerin, Vibrio Alginolyticus Ferment Filtrate, Terminalia Ferdinandiana (Kakadu Plum) Fruit Extract, Sodium Polyacrylate, Butylene Glycol, Panthenol (Vitamin B5), Bambusa Vulgaris (Bamboo) Shoot Extract, Nelumbo Nucifera (Lotus) Flower Extract, Ascorbic Acid (Vitamin C), Sodium Hyaluronate, Nymphaea Alba (Water Lily) Root Extract, Microcitrus Australasica (Caviar Lime) Fruit Extract, Citrus Aurantium Amara (Bitter Orange) Fruit Extract, Citrus Reticulata (Tangerine) Fruit Extract, Citrus Sinensis (Orange) Fruit Extract, Copper Gluconate, Lactic Acid, Lysolecithin, Magnesium Aspartate, Niacinamide, Potassium Aspartate, Pullulan, Sarcosine, Sclerotium Gum, Silk Amino Acids, Sodium Cocoyl Amino Acids, Xanthan Gum, Zinc Gluconate, Carbomer, Citric Acid, Aminomethyl Propanol, Tetrasodium Glutamate Diacetate. Vitamin C is one of the most powerful of the antioxidants, helping to both heal the damage caused by too much exposure to the sun (UV induced damage) and protecting your skin from further damage (you still need to wear a sunscreen). The benefits of applying vitamin C to your skin in serum form, cannot be understated, because a serum allows the vitamin C to deeply penetrate your skin. So if you have mild hyper-pigmentation or slight discolorations in your skin, fine lines and wrinkles, or your skin is looking dry, dull and tired, then a vitamin C serum can help you to re-hydrate your skin, plump up the collagen and give your skin a brighter and more even skin tone. Essential in cell renewal and cellular repair. Kakadu Plum is harvested from the Australian Rainforest and is the world’s richest, natural source of Vitamin C.
In fact it is packed full of vitamin C and lots of other antioxidants and is a super ingredient to have in your skincare routine. Indigenous Australians, have been using Kakadu Plums for thousands of years as a traditional antiseptic and healing remedy, and studies have shown that the concentration of vitamin C in the Kakadu Plum is as high as 3200-5000mg/100g (compared with 50mg/100g for oranges). Not many skincare products use the Kakadu Plum, because it is a fairly new ingredient on the market and is only grown in one area of Australia, so when you find a product that contains it, you need to jump on it, because it really is a super antioxidant. Hyaluronic acid is known as the fountain of youth, because it deeply penetrates the cells of your skin delivering a super pulse of hydration. It is also essential for the production of collagen in your skin and this is one of the reasons why, as we age, our skin starts to sag. The amount of hyaluronic acid in our skin seriously reduces as we age and if we don’t replace it, the amount of collagen in our skin reduces and our skin starts to loose its definition and to sag. This is why hyaluronic acid serums are so wonderful for our skin and why having hyaluronic acid included in your vitamin c serum is so beneficial to us. The reason why amino peptides are such a vital ingredient in your vitamin c facial serum is because of its role in collagen production. Collagen is composed of long chains of amino acid bound by peptides and when collagen breaks down as we age (around the mid 30’s), these chains of amino acids send signals to our skin’s cells to start making more collagen. Unfortunately, our cell’s ability to receive these signals declines leading to a decline in collagen production. This results in the formation of wrinkles and creases and our skin begins to lose definition and sag. These amino peptides however, don’t replace the lost collagen, instead they stimulate your body to increase production of collagen. Native to the Australian Rainforests, Caviar Limes are rich in alpha hydroxy acids (AHAs), which are fabulous for exfoliating your skin and removing the top layer of dead skin cells. Because of their exfoliating properties, Caviar Limes also help to reduce hyper-pigmentation in your skin and to heal mild acne and acne scarring. Aloe Vera is rich in Vitamin C, E and beta carotene, which makes it ideal as an anti-aging ingredient in your facial serum. Chocked with antioxidants, Aloe Vera helps to protect your skin from UV damage and to reverse the signs of any existing damage to your skin. Aloe Vera helps to moisturize your skin without making it greasy, making it perfect for people with oily skin. It also helps to heal sunburn, aids in cellular repair and reduces the inflammation that comes with acne. The vast majority of online customer reviews are extremely positive with customers finding that this vitamin C serum is perfect for their sensitive or very dry skin. Their skin looks and feel much softer, brighter and healthier, after only a short period of using this serum. I like the product. It’s consistency is like a gel. Its light, non-greasy, and a small amount covers the entire face, so I feel it will last a while. My skin has appeared more “glowing” and I can’t say for certain about wrinkles and dark spots as I didn’t do before and after photos but overall my skin really enjoys this stuff! I’m on my second bottle & I still love it! My skin is much smoother & makeup goes on so much nicer! Been using this product for about 6 months now and I love it! This stuff is awesome! I love everything by this company so far. I love the face food under my make-up and this stuff works great under that, not oily at all. I noticed within a few days of use (morning & evening) that my skin looked so much brighter. The fine lines have disappeared while the deeper wrinkles have diminished. Great product. NutraNuva is becoming my go to brand! 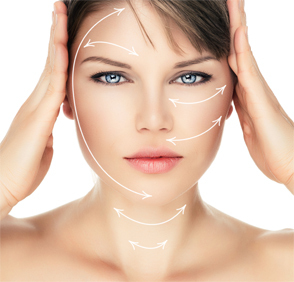 FACE FOOD has made my skin SO much better; lines and wrinkles lessened – I just look YOUNGER. Never been so impressed with a skincare product. NutraNuva is a very popular brand with customers coming back for more, time and time again. It has been seen on ABC, NBC, CBS and FOX and is packed with lots of fabulous ingredients that nourish, renew and repair your skin. With 20% vitamin C, hyaluronic acid and lots of antioxidants to brighten your complexion, plump up your skin, deeply moisturize your cells and give your skin a smoother feel and a more radiant glow, this is a lovely facial serum that deserves a place in your beauty routine.